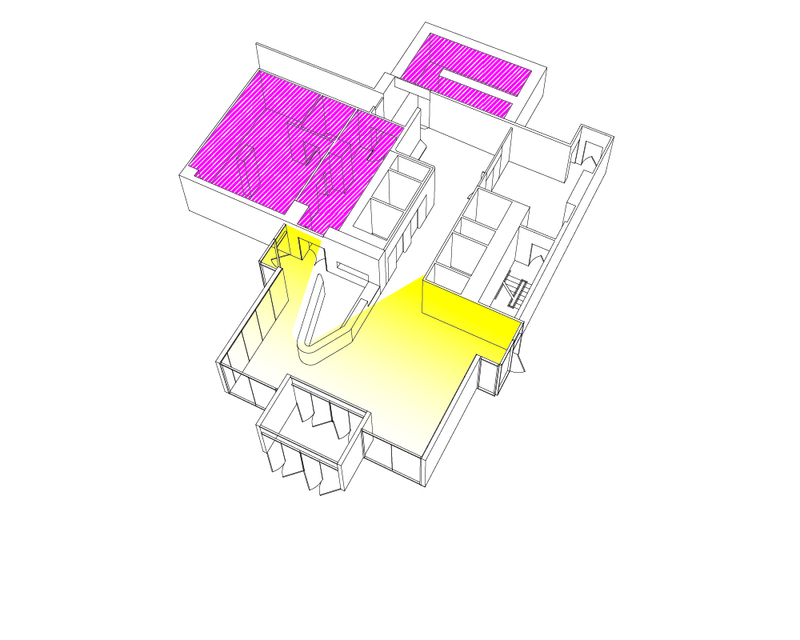 HOW DO WE BUILD PUBLIC SPACE IN THE ERA OF ON-DEMAND CULTURE? 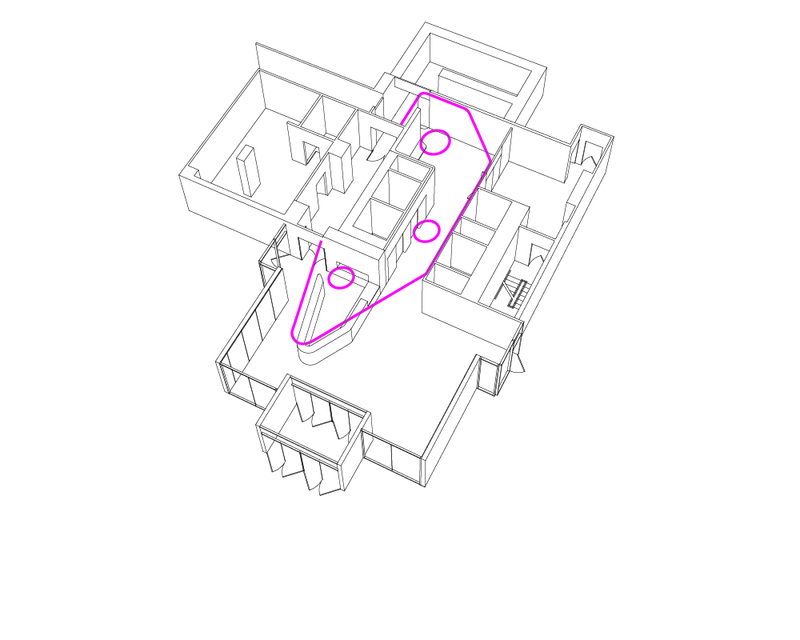 PUT THE PEOPLE IN ONE PLACE AND THE PACKAGES IN ANOTHER. 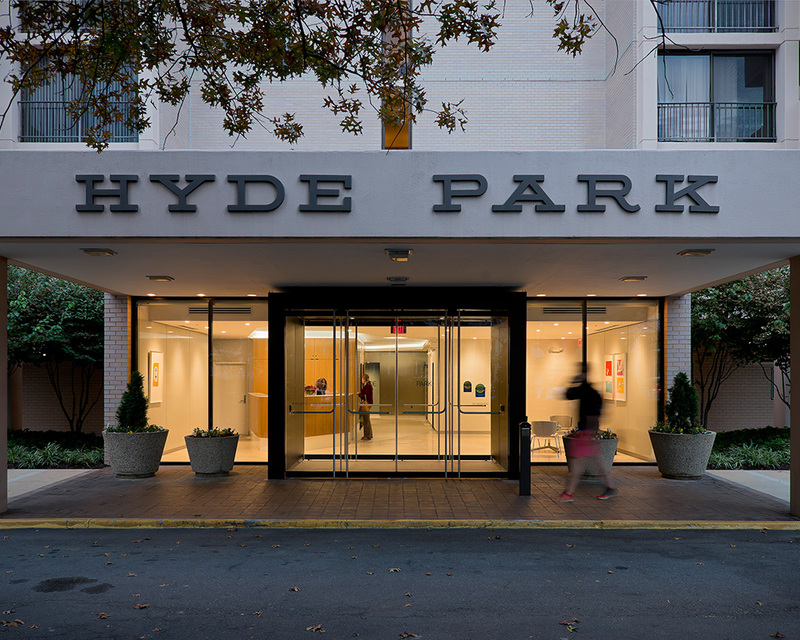 Architecture Lab, December 30, 2015: "Hyde Park Condominiums: Lobby Renovation / E/L Studio"
The Hyde Park in Arlington, Virginia, is a landmark high-modernist condominium building designed by esteemed architect Vlastimil Koubek in the 1960s. 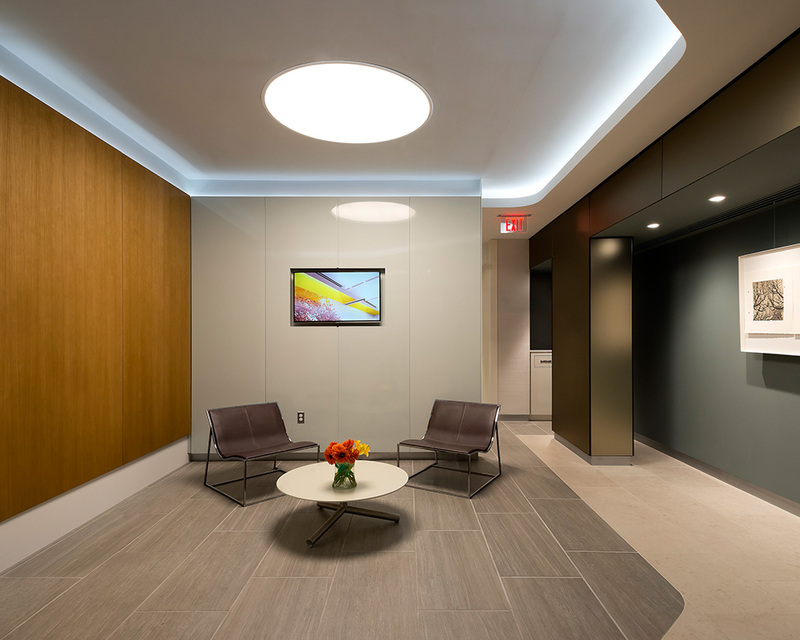 We completely renovated the lobby in order to create aesthetic cohesion, maximize lobby space and storage capacity, and delineate the movement paths of tenants and service providers. 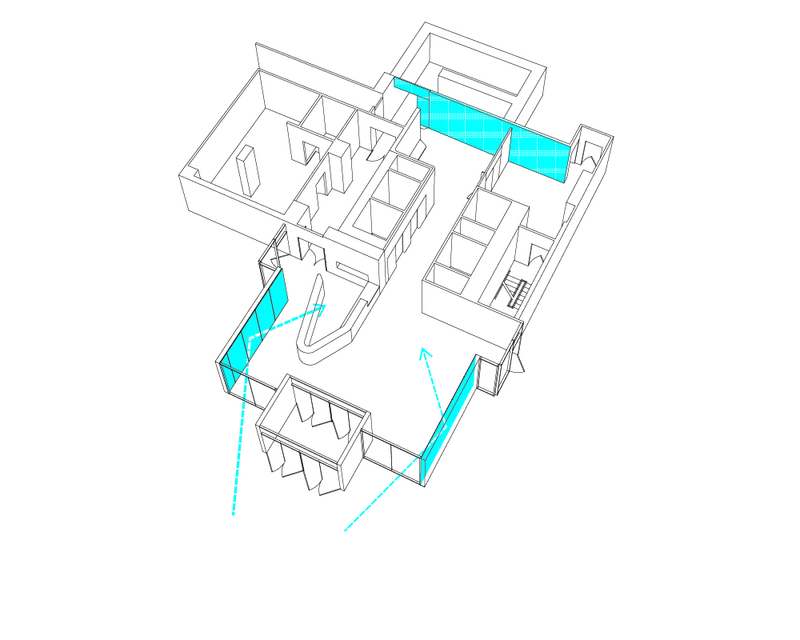 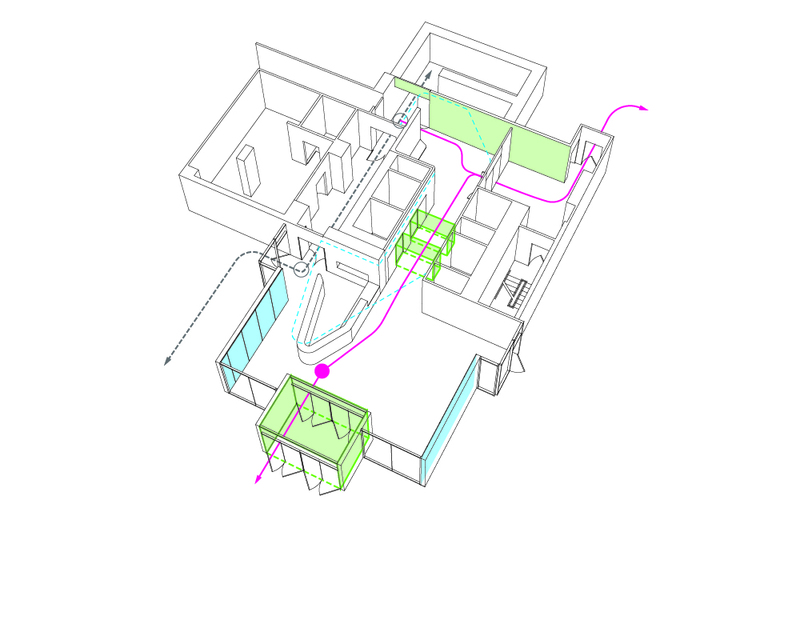 The design scheme employs a “cascading threshold” concept which allows for movement through a series of increasingly intimate spaces to reach the interior of the building. 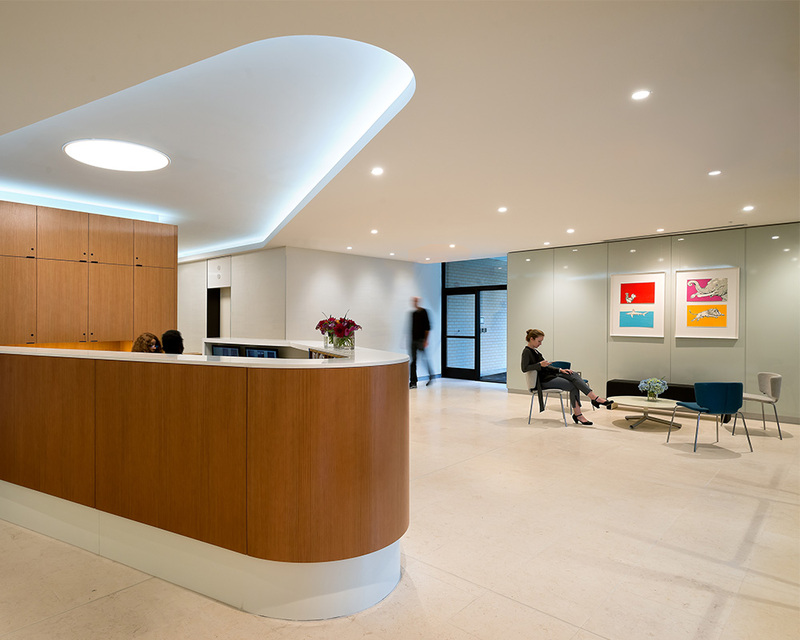 The reception area was last updated in the 1980s, with design elements inimical to the building’s exterior. 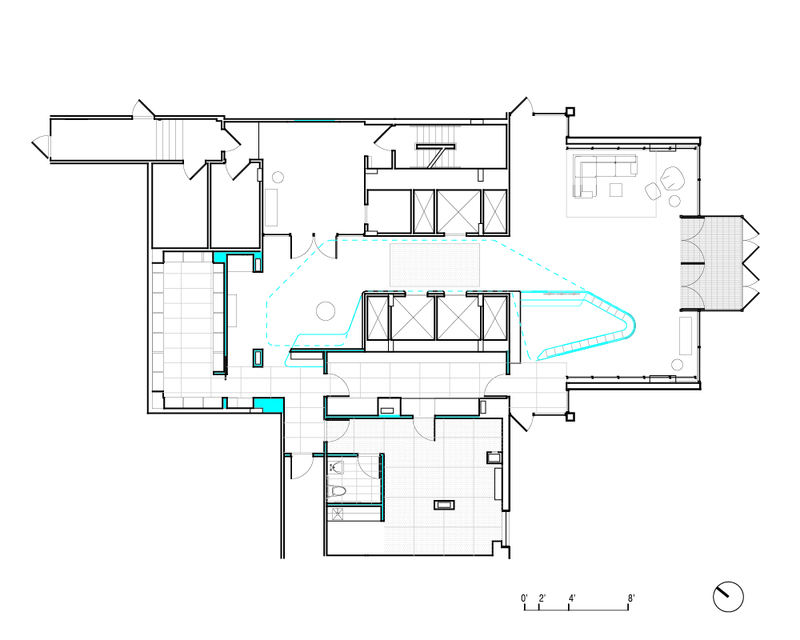 Additionally, the configuration of the lobby and adjacent storage areas had proved inadequate for the capacity now required. 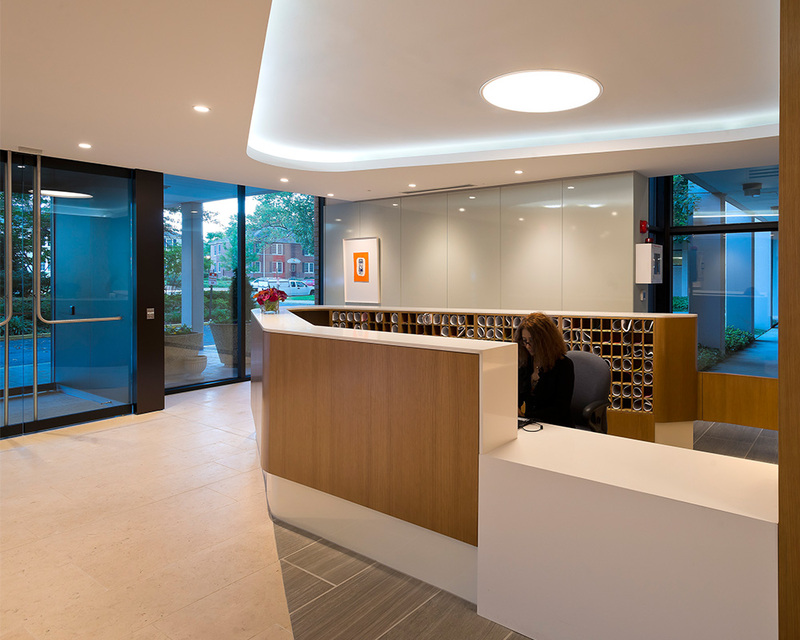 With the strategic placement of the newly configured reception desk close to the elevator core, the design delineates a separate delivery entrance and storage areas which greatly increases package storage capacity and improves circulation. 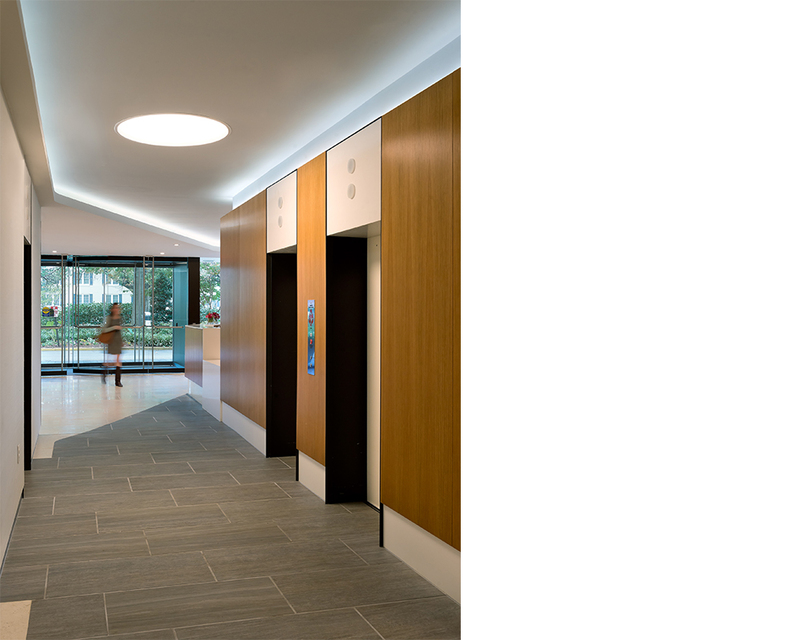 We incorporated indoor and outdoor elements by selecting materials and finishes that recall natural elements but remain consistent with the modern ethos of the base-building architecture. 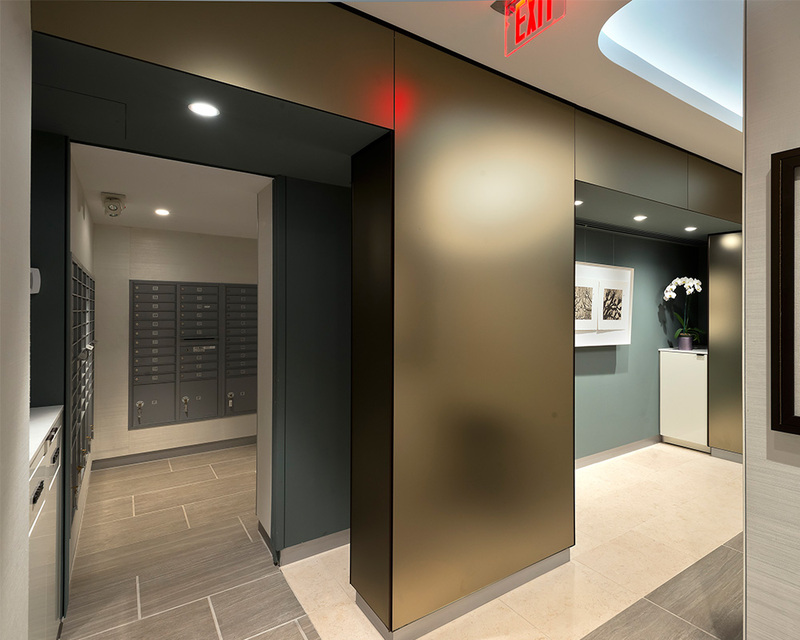 The newly designed Hyde Park now unites an elegant reception area with formal and informal gathering spaces for guests and a highly organized and functioning management area for essential services. 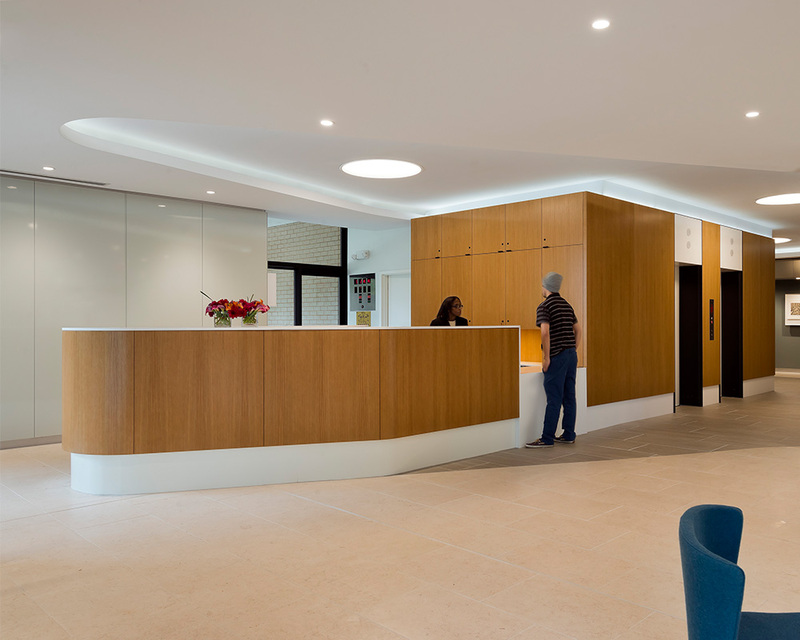 We reintroduced a modernist vocabulary to the reception area, creating a clean, open and welcoming entrance for residents and visitors alike, with consequent improvements in circulation. 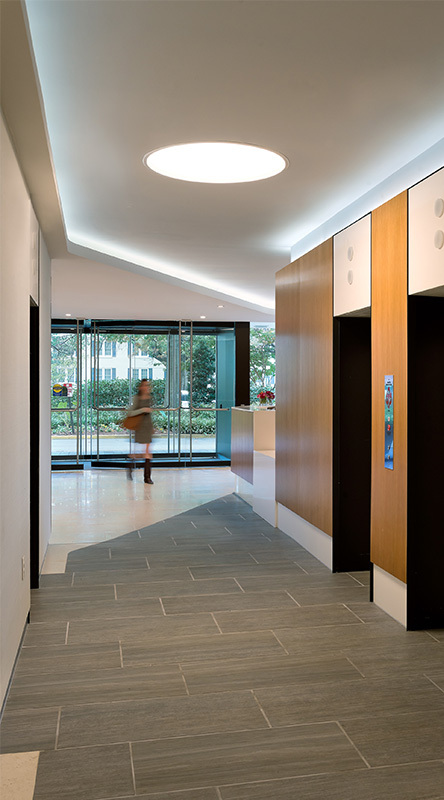 Stone flooring and wood millwork, a bronze-lined vestibule and door thresholds, organic shapes and naturally inspired paint colors enhance the feeling of warmth, and provide a welcome contrast to the clean lines of the exterior.